This was by far my favorite story of 2018, and probably the story that I am most proud of from my entire career yet as a journalist. Not just because of the article’s international relevance and the impact it had, but primarily because of how detailed, readable and thrilling the final text was edited to become – credit goes out to the editor, Gergo Saling for that. According to my exprience, you always find the best stories by coincidence. This was also the case with the saga of Vladimir Lyubishin and his son and how I found out about it. Originally, I started investigating a completely different story, Russian intelligence activity, in the summer of 2018. One of my Hungarian sources well-informed on defense matters told me that two Russians had been arrested by Hungarian authorities in recent years, but it was kept secret. The source did not know further details, just that it had happened before the Skripal poisoning and the diplomatic expulsions that followed. The biggest enemies of all journalists are their own prejudices and assumptions, hence I was convinced for a long time that those Russians were military intelligence officers. Moreover, I did not even take one of my other sources’ claims seriously when this source – who follows the Hungarian defense industry closely – told me something contradicting. The source said that the Russians were arms dealers, not spies, and the operation to bust them was led by U.S. authorities, not Hungarians. Support Direkt36, invest in democracy! I tried to gather more information for long weeks, but without any success. Then a third source finally gave me a name. Things started to speed up, thanks to the online US court database (PACER) where I managed to find a court case that looked more than thrilling even at first glance. Most of the documents associated with this court case were sealed, however, I could download a very important one. A DEA special agent testified before a federal judge and described the details of a complicated DEA investigation involving surveillance, captured message exchanges and photos of weapons. Then it took a long time for me to process all the court documents. In these documents, however, people, countries and cities were referred to by codenames only. Luckily, I knew from older news pieces that the Russian arms dealers had ties to a Hungarian company, hence it was obvious that most parts of the DEA operation took place in Hungary. We looked up company registries and gathered every available information on the two Russians, then contacted a former Hungarian business partner. The information he gave us proved that most of the retracted locations in court documents are referring to Hungary indeed. The former business partner also told us how counter-terror units raided the company’s warehouse. 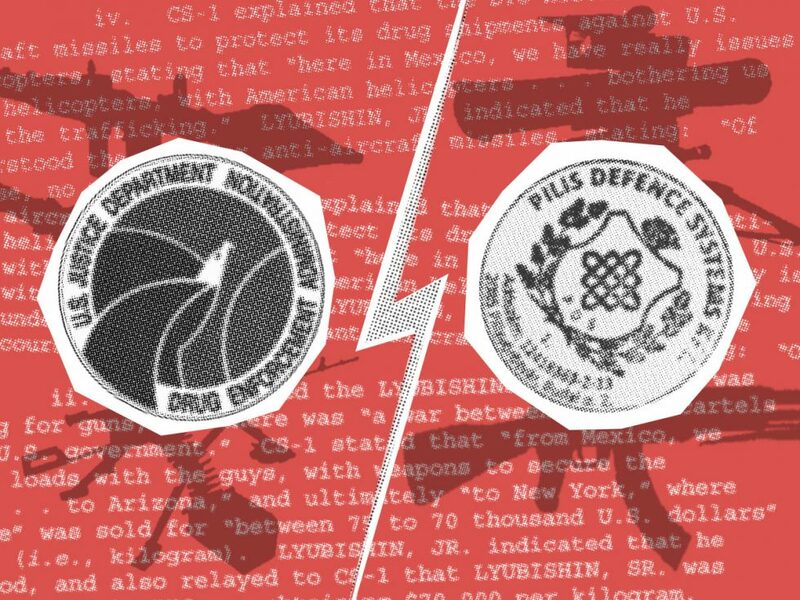 I needed to understand why the Lyubishins were doing business from Budapest, and how it was possible that they were open to negotiate with alleged members of a Mexican drug cartel. I had multiple meetings with active or retired arms dealers for on background conversations. They were constantly quoting a 2005 Nicholas Cage movie named Lord of War while trying to explain the context. The movie’s protagonist, Yuri Orlov, is a fictional Ukrainian-American arms dealer. After the fall of the Soviet Union, with the help of corrupt army officers, Orlov smuggled weapons from Ukraine and other Warsaw Pact countries and sold them to dictators, warlords and drug cartels. Third world countries knew these Soviet-made weapons very well as they are cheap, reliable and rarely break down – in case they do, the Soviet weapons are easy to repair or replace anyway. Meanwhile, I tried to contact the Russians’ associate, Hamit Nasirlioglu, a Turkish national who was also apprehended by the DEA – but he is still in a New York prison. When I searched the internet for his name, I found Serbian language articles. This is how I discovered the name of the covert DEA operation, Perseus, for example. U.S. authorities are obsessed with giving fancy names to their operations. Perseus is a famous hero in Greek mythology, who went on a mission to cut the head of Medusa, a mythical creature. Perseus was helped by gods who gave him magical weapons, like a shield and a helmet that made him invisible. Since Medusa, one of the Gorgon monsters, turned people to stone with her gaze instantly, Perseus had to approach her by only looking at Medusa’s reflection in his shield. Once Perseus managed to cut her head, he used the magic helmet to escape the Gorgons’ cave. According to U.S. court documents, the DEA’s Perseus operation was equipped with a modernized version of these gadgets: U.S. investigators were using secret surveillance and confidential sources to cut down the head of an arms trade network. I obtained phone numbers to the Russians who were locked up in their cells in Moscow for quite a time. I called a Moscow number and a young man’s voice answered. After introducing myself in English as a journalist, however, he hung up on me immediately. Then I sent text messages and the Russians’ Hungarian lawyer called me back. He was open to answer my questions. The Russian voice who picked up the phone likely belonged to Lyubishin Jr. He is guarded less strictly than his father, and just like in Hungary, prisoners in Russia are usually able to hide cell phones. The Lyubishins’ lawyer, Robert Fridman, helped me to understand, among other things, what kind of diplomatic and legal battle took place in Hungary between the U.S. and Russia as both countries tried to enforce their extradition requests for the Russian arms dealers. The U.S. administration was shocked that Viktor Orbán’s government decided to help Moscow, but I knew this already. However, the matter was so sensitive from a diplomatic perspective that most of my sources directly involved in the Russians’ case from both governments stayed silent. There was a source who must have known everything, or at least this is what I suspected from the longs silences while we talked, but this source was only willing to walk me through the extradition process in general. Another source, initially helpful and friendly, became very serious as soon as I mentioned the name Lyubishin, and redirected me to the press office. It is not a coincidence my sources were so cautious as the story of the Russian arms dealers, revealed by Direkt36, is a well-documented example of how Hungary’s government tries to maintain a close relationship with the Kremlin – even at the cost of hurting a NATO ally’s national security interests. It is natural that Hungarians wanted to keep everything in secret, but U.S. diplomacy did not want to go public with this story either as the State Department’s new policy is to avoid any criticism of the Orbán government. I only received „no comment” answers from State Department, the DEA, DOJ, the U.S. Embassy in Budapest and the Southern district of New York attorney’s office to my original inquiry. After publication, however, State Department spokesperson Heather Nauert issued a statement. She used sentences we haven’t seen for a long time, like „the United States is disappointed in the Hungarian government’s decision to extradite the Lyubishins to Russia”, or that „this decision is not consistent with our law enforcement partnership, undercuts the work that our agencies had done together to build this case, and will make citizens in the United States, Hungary, and the world less safe.” The article has won the Quality Journalism Award in November 2018, awarded for the best articles in Hungarian journalism each month. Here is the follow-up to the story.